Keith Earls insists there will be "nothing new" in facing a physical onslaught from England in Dublin on Saturday as Ireland begin their Guinness Six Nations title defence. Head coach Joe Schmidt has warned Ireland to beware England's "brutality" at the Aviva Stadium, with England potentially able to boast an array of ball-carrying threats in Mako and Billy Vunipola up front, and Ben Te'o and Manu Tuilagi in midfield. But the unfazed Munster wing Earls believes every Test match is just as physical as the next, suggesting Ireland will continue to try to "outsmart" opponents. "Every game we play in is brutal and physical because it's 15 men trying to kill another 15 men within the rules of the game, you know?" said Earls. "I wouldn't get too bogged down in it. I'd obviously expect a game like that to be brutal, brutally physical. As I said, they are expected to be brutally physical against Scotland, Italians and the Welsh as well. "So, it's nothing new, it's just the two coaches; on the field, we always know it's going to be brutal. Of course, they're a top quality side. "I think with the Vunipola brothers coming back, they are going to have threats all over the field. "We're going to have to start strong, not like we did in the last couple of years where we kind of had a slow start or a Johnny Sexton kick getting us out of trouble. "I suppose that puts a lot of pressure on us as well. We know the challenge that's in front of us is massive. I think teams do try to outsmart them. That's why we come up with moves, to outsmart them. But obviously you cannot outsmart them if you are not physical. 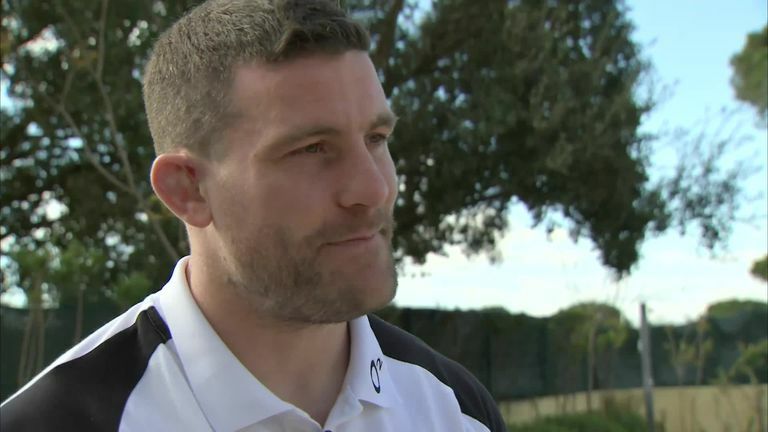 England back row Mark Wilson says he will be ready to play at six, seven or eight in their Six Nations opener in Dublin against Ireland. "If either team has a physical dominance that's where it starts, whether it is from set-piece or the breakdown. If you don't win any of them, you don't get an opportunity to throw moves at them. "Obviously it's quite important to outsmart them but I think it will come down to how much of the basics wins you these big games as well." Full-back Rob Kearney and loosehead prop Jack McGrath have linked up with Ireland after featuring for Leinster at the weekend instead of heading to the warm-weather training camp in Portugal. Ireland could be forgiven for weighing up fighting fire with fire on the physical front, especially in the wake of Schmidt's predictions for the clash. Earls' assertions of Ireland sticking to Schmidt's hugely-successful match-specific special moves hints at a group rightly displaying the confidence of an all-conquering 2018. The British and Irish Lions flyer knows full well however just what the fit-again Vunipola brothers will add to England's armoury, with Ireland still buoyant from last year's Grand Slam and November toppling of New Zealand. "Mako, a loosehead, I don't know how he's able to ball play; he brings that extra dimension for them," said Earls. "And Billy does what he does best: he runs over fellas.